If for any reason the pulp space is exposed to the outside, the tissue becomes contaminated and eventually infected. The exposure of pulp happens in many circumstances, such as when you have a large cavity or a fractured tooth.Your dentist can explain the exact reason for damage to this tissue. 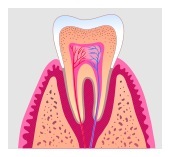 In these cases, the treatment is usually root canal treatment. If you have any questions about root canal treatment and you live in or around Gurnee, give us a call today!